The trend towards eco-friendly home construction has extended into the world of interior furnishings, and buyers now have a plethora of options for “green” countertops. These countertops make excellent use of environmentally responsible materials, procurement and building practices, and offer new and exciting design options to homeowners. Green homes in Calgary can make use of everything from terrazzo and plastics to stainless steel and recycled materials, which can be finished in a range of styles to suit your tastes and interior design preferences. Granite. Still the most-often requested counter-top material, sales for granite have increased ten times over the last ten years or so. Granite is popular for its vast array of beautiful shades and striations, plus its exceptional durability. It lasts a lifetime and should never require replacement. Stone countertops can help improve the air quality ion your home, and are a natural option, making them an eco-friendly choice as well. Terrazzo. This combination of crushed stone and glass offers a unique, colourful look that adds style while reducing your environmental footprint. The raw materials are fused together with a binding agent, then finished and polished for a slightly glossy appearance. Recycled glass. Combining recycled glass with concrete creates an appearance similar to terrazzo, and reduces the amount of waste in your local landfill if you source it from manufacturers in your area. Plastic. Recycled plastic can be custom-finished in an astonishing range of looks and styles, and this option is both durable and easy to maintain. Plastic countertops are also very low in volatile organic compounds (VOCs), making your home safer and contributing to better indoor air quality throughout the year. Paper composites. You might not think of paper when you think of countertop material, but you can actually make excellent use of recycled paper, which is typically mixed with wood, concrete and resin to create an appearance similar to natural stone. Recycled aluminum. Waste aluminum can be repurposed for countertops by mixing it with polyester resin to create an exceptionally smooth and durable countertop. However, you should carefully research manufacturers to make sure they’re following environmental best practices. Wood. 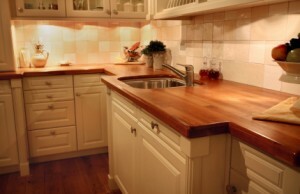 Reclaimed or salvaged wood makes an excellent choice for a countertop if you prefer a rustic look. Bamboo is also a great choice, as it’s one of the most eco-friendly natural building materials on the planet. Stainless steel. If you want the durability and modern appeal of stainless steel, research manufacturers who offer recycled steel countertops. Many of these products contain at least 65 per cent recycled material, but if you do some digging, you can outfit green homes in Calgary with 100 per cent recycled stainless steel countertops. Tile. As with laminates and stainless steel, you can get ceramic tile that is comprised of a high percentage of recycled material. As an alternative, you can also source recycled glass tile, which is recovered through a specialized process known as sintering. Again, stick with local manufacturers for optimal ecological benefit. Concrete. Traditional concrete requires an energy-intensive manufacturing process, which doesn’t make it a good choice for the environmentally conscious homeowner. However, you can substitute regular concrete for a material known as coal ash or flyash, which is made up of the byproducts generated at coal-burning power plants. These countertops replicate regular concrete extremely well, and offer the same durability and ease of maintenance benefits. Resin Panels: The Wave of the Future in Eco-Friendly Countertops? Resin panels are one last product you can consider for green homes in Calgary. While resin panel countertops are only available through a select few manufacturers and suppliers, it’s expected that this material will become increasingly more common in the years to come. The resin panels that make up the countertop are sourced from recycled and multi-cycled raw materials, and are available in a wide range of brilliant colours. At Fine Line Homes we prioritize energy efficiency and environmental awareness in every step of the home design and construction process. Drawing on proven principles that provide superior energy efficiency and reduce the environmental impact of home construction, we create custom dream homes at highly competitive prices, helping homeowners achieve significant savings on their energy and upkeep costs while alsoproviding superior resale values. If you would like to learn more about our environmentally friendly and energy-saving building practices, or if you have any other questions, please don’t hesitate to contact a Fine Line Homes customer service representative.